The paper tubes serve for winding of rolls of paper, artificial leathers, plastic foils, carpets, textiles,etc. They are produced by spiral or parallel winding, it is possible to produce even tubes with reserve (so called flag). By changes of setup of wound layers in production it is possible to achieve various quality especially radial strength value. The manufactured tubes can be cut to lengths required (the cores). Such cores are of use at first for winding of narrow strips of various materials (adhesive tapes,foils,textiles, etc.) or for fixing of goods transported in cartons or boxes. 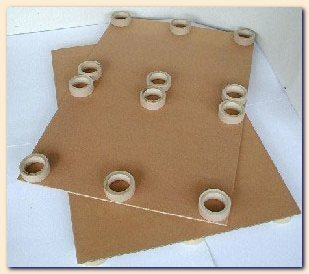 The paper tubes for building industry - cylindrical crating of paper - is used in building industry for concreting of columns and supports or for unloading of monolithic concreted constructions like bo s of bridges, ceilings, dams or for an intentional creating of cavities in concrete constructions for laying of piping and cables. This cylindrical crating is manufactured from spiral wound paper tubes with both inside and outside surface treated with protective layer in order to increase smoothness and water resistance. The crating is produced with inside diameter from 200 to 600 mm with lengths in step of 500 mm up to 6 000 mm. The conical paper cores are mostly used in textile industry as yarn carriers.After customer´s wish surface can be smooth, grooved, knurled, additionally felted or colour printed.The tips of conical cores can be cut-off straight or crimped inwards. On core foot grooves for reserve or slits can be created. The cores wound spirally from some layers of paper are used above all in production of man made fibres.They are manufactured on modern machines from high quality raw materials to attain sufficient strength and accuracy. They are delivered in a wide assortment of dimensions, colours and finishing. According to customer´s wish they can be furnished with grooves, peripheral slits, bends, stiffened ends, Y-cuts etc. The core production range is 40 to 110 mm for inner diameter. maximum outside diameter is 125 mm. 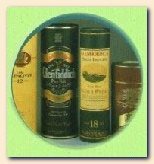 The cylindrical paper tubes are of use as carriers of yarn, sewing threads and man made fibres in textile industry or paper tape rolls for cash registers, devices and facsimile devices. They create bo s of packages for various industrial and consumer goods, or in production of entertainment pyrotechnics they create even package for charge proper. 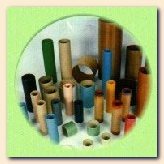 The cylindrical paper cores are produced by longitudinal or spiral winding of paper. core surface printing with one-colour printing or of inscriptions or signs according to customer´s wish is possible. 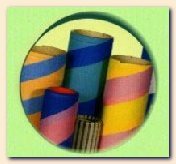 The disk paper bobbins are used above all in textile industry and in rubber and plastics industry for making-up of ribbons, deckle straps, sleevings, various hoses, cords and ropes and waist straps. The bobbin faces are made from smooth paperboards or plastics. As a body paper core is used. The paper sleeves are manufactured by spiral winding of some paper strips. In accordance with customer´s wish it is possible to apply water-repellent treatment increasing their service life. They are used exclusively in glass fibres production. The one-way paper pallets are produced of 5-layer corrugated bord, with braces created by rings made from paper tubes. An increasing call for transport pallets about 50 to 60 mm high wide used in oversea container transport of goods has been a motive to production. Low cost and sufficient strength are main priorities of new introduced product. In addition to standard pallet size (1 150 x 760 mm) also another sizes are offered (like 1 900 x 760 mm and others). pallets are delivered by 46 pcs on pallet covered with stretch foil. Tri-Wall pallets are ideal replacements for wooden pallets where weight, safety, recyclable or import and export restrictions are a concern. At a fraction of weight of wood, Tri-Wall pallet reduce freight costs and can be handled safely without mechanical assistance. Tri-Wall pallets are designed to your specifications. Why you should use Tri-Wall Pallets?